Terrain: We didn’t come all this way to cut any corners, so we wanted to start at the very beginning of the Four Rivers Bike Path. If you feel the same, be warned: it’s quite difficult to find. Our map above has coordinates that might save you from getting lost in the industrial hinterland of Seoul. Other than the elusive starting line, it’s 40 of the most enjoyable kilometres you could ever ride anywhere. Flat, scenic, and plenty of facilities. Nothing could possibly go wrong, unless it bucketed down the night before. 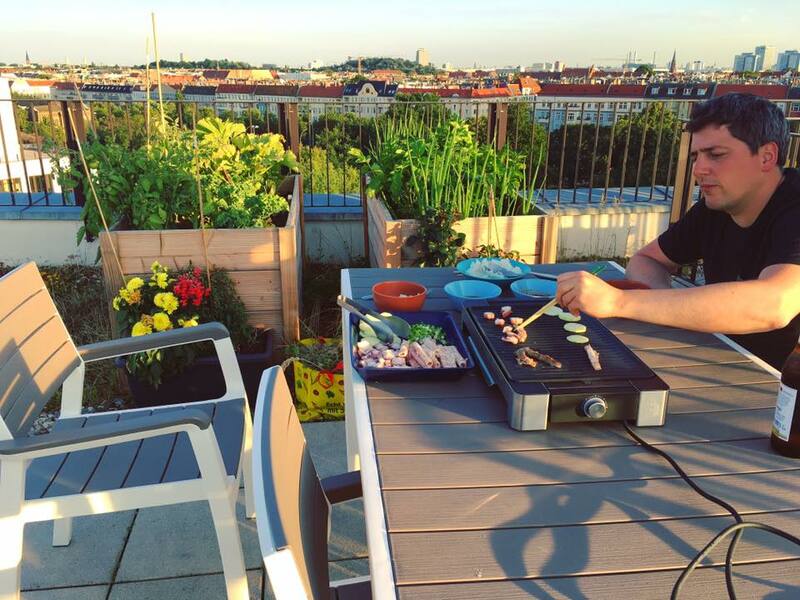 Most exclusive rooftop restaurant in town. “Mumble mumble grumble 50 kilos”, said the befuddled head agent. And so on. Eventually, it all got sorted, but not before they delivered their coup de grace of idiocy. Cue another delay as Neil went in search of an ATM, while the queue looked on with murder in their eyes. Inching closer and closer to the entirely unqualified counter staff at Air France. After experiencing such incompetence, the first meal of the honeymoon has to be Burger King’s finest. Note the time on Neil’s phone. Not our proudest moment, but we won’t be apologising for it either. After a stopover in Paris, we landed in Seoul at 7:20 AM today. Immediately, we marvelled at shiny Incheon Terminal 2, which just opened in January this year. It even smells new, with floors so clean you could eat your dinner off them. Technology plays a huge role in daily operations, as dozens of self-check-in and smart bag-drop machines are included in order to serve passengers. Apparently once this project is completed in 2025, there will also be a fleet of robots on standby to help passengers find their way within the terminal facilities. And after that, they’ll probably build teleportation devices to whisk us from A to B because the sky’s the limit here, it seems. We shall now demonstrate. Passengers can scan their boarding passes to get personalised information on their transfers. If you’re still confused, bright clear signs lead you to the Transfer area, where even moar machines are waiting to meet your every need. This means that you don’t have to talk to a single human being during this transaction, which makes Jess very happy. We didn’t have to wait long for our first go at a smart toilet - they’ve got them in the airport! And, because Koreans know that not everyone reads their language, handy illustrations that accurately depict each function are there for the jet-lagged tourist so unpleasant surprises are avoided. 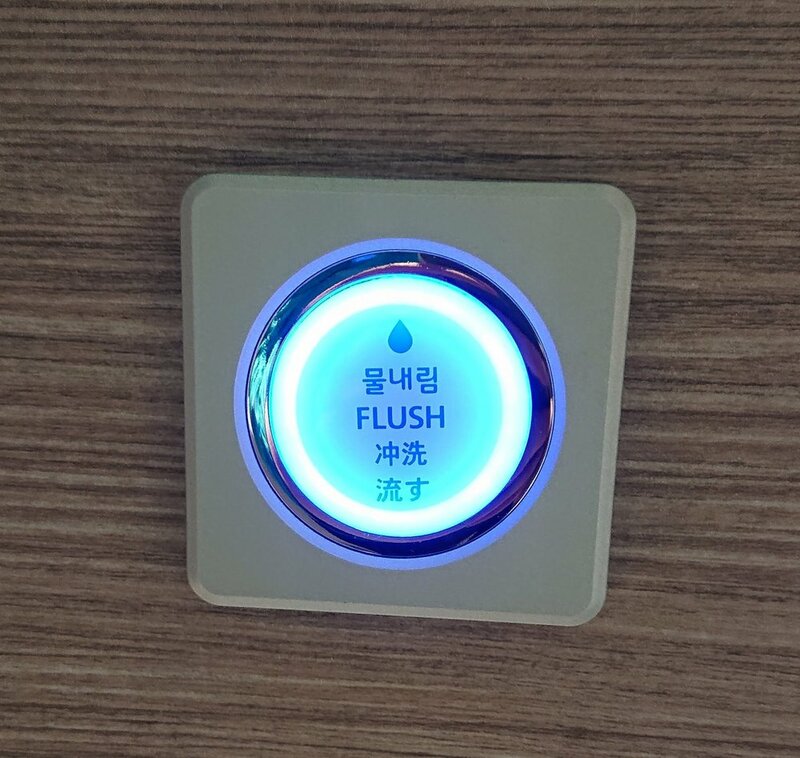 Even the flush buttons in Korea are flashy. Despite the usual fears that pop up when you check luggage into the hold, both bike boxes and our panniers arrived on the other side unscathed. We were actually surprised at how little faff there was on this end compared with our starting point yesterday. Picking up our sim cards at a kiosk (we ordered them from Trazy before we left Berlin, but this one is also a good option) was simple and straightforward. Getting some cash was the next step, and though our jetlagged brains were initially overwhelmed by Korea’s uniquely full-featured ATMs, we were able to procure piles of won without accidentally ordering pizza delivery or cinema tickets. Note that you can only use foreign cards at machines with a “Global Service” sign on them - these are plentiful at the airport, but less so elsewhere, so be prepared for a runaround. So here we are, “fresh” off a gruelling intercontinental flight, sitting in the airport early on a rainy Friday morning. What better way to start the trip than putting the bike together and just riding straight into Seoul? The way we saw it, we had two options here: build the tandem inside the airport, try to get it onto public transport, and hope we’re not breaking any rules, or keep everything packed up until we’re properly outside, then put it together and ride off. We opted for the latter because we had no idea if we’d be able to manoeuvre our bulky bike and luggage through whatever lay ahead of us. The Four Rivers Bike Trail starts at the Ara Lock, which is a short distance from the Cheongna International City Station stop on the airport shuttle into Seoul city center. We had read conflicting reports that they only allow bikes on certain carriages on certain days of the week with a corresponding ticket, but there isn’t any official documentation about this. When we were still doing research back at home, the only helpful thing we could find was this guide on how to use the Korail App should you want to travel within the country that way. This article also explains bike etiquette on the underground inside Seoul. Latest airport shuttle schedule as of June 2018. You want to go this way into Seoul. All aboard. So far, so good. Surprisingly uncrowded train to Seoul. And then the first hurdle came up. Due to the layout of each station, we had to run back and forth, hauling our stuff from one end of the platform to the other. Up elevators and along corridors we went, shuffling our boxes and bags like we were in one of those logic puzzles where you have to get a wolf, a sheep and a cabbage across a river. Several trips later we got everything outside, thanks in part to two incredibly kind people who saw our predicament and rolled their sleeves up to help us. By the end of it, our cargo was in a sad state - the bike boxes were ripped at the seams and our bag carrying the panniers was completely destroyed. Now seemed like a good time as any to strike up the A-Team music and put the tandem back together. It’s been two years since our last tour, so we were a bit rusty on building the bike, and we were expecting the usual gremlins. Burma was all about the timing chain and creaky frame, and in Northern Ireland, we lost our bottom two gears. This time, we were able to just ride off without a hitch. We were lucky that everything came through transit unscathed, but thanks are also due to our friends at Pedalpower, who gave old Samson a thorough fettling in advance of the trip. During the build process, we attracted the attention of a man who stood and watched us put the two halves together. Once he realised what he was looking at, he let out a huge laugh of astonishment. And so we went off in search of the starting point for the Four Rivers Bike Trail. It’s not the easiest thing to find as it’s not clearly marked anywhere on Naver, and we ended up traversing the same roads again and again, wasting half an hour on one particular 2.4 kilometre stretch. Sure, we could have just joined the bits of the path that we first stumbled across and carried on from there, but it was important to us that we do this right from the beginning. You see, a big motivator for this journey was the fact that you could get a “passport” and collect stamps along the way. Jess loves stamps. These booklets can only be collected at specified points (the Ara Lock being one of them), so it was crucial that we find this one. It might seem silly, but we didn’t know when we would ever get to do this again, so we wanted to have the full experience. It wouldn’t be a Calderwood trip without some light industrial action. Getting somewhere. The start of the Four Rivers Bike Trail is behind this building. This is the monument you want to look out for. The Tourist Center is inside this building, and you can purchase cycling passports here for 4,000 won each. They also come with a map of all four river trails and stamp points. FINALLY. This is located slightly beyond the Tourist Center on the other side, closest to the river (obviously). These red phone booths are where a stamp can be procured. They will become a familiar sight on this trip. This is the first one. Finally, we were on our way. The bike path from here to Seoul is incredibly well laid out. First impressions are that it’s nicely maintained, flat as a pancake, with ample clean toilet facilities and service areas for drinks and snacks. There’s a walking path running directly parallel, where you can find Korea’s older generation out for a brisk walk. Occasional exercise spots should you want to work on cardio, as well as pavilions for picnics or a short nap, dot the landscape. On this particular segment, we even saw an outdoor art installation and a climbing wall. The public toilets are manned by electronic signs that allow people outside to know when they are occupied. Doors open and close using the elevator switches on the control panel, which is adorably designed. Since we only had a short distance to do, we thought that the day would be smooth sailing. For 35 out of those 40 kilometres, it was. It was so easy that we couldn’t believe our luck, and we rode along thinking this was the easiest introduction to cycling in a new country that we had ever had in our years of touring. But because it had rained cats and dogs for three straight days prior, some parts of the route were flooded. This wasn’t really a problem for us until we got closer to Seoul and came across the river crossing that we needed to take to get into the city. It was completely submerged under water, and there was no way we were going to be able to use it. Unfortunately, that was the only prescribed bike path on the Four Rivers Trail, so we were on our own at this point, as there weren’t any bike detours provided on any signs. Using Naver, we started picking our way past each of the 27 bridges that connect the metropolitan area across the Han River, shunning any that weren’t bike-friendly and finally finding one that we could actually get access to. And even the one that we eventually rode across was less than ideal, mostly because its “bike path” ended at the top of 3 flights of stairs. Our final mission was trying to gently steer a loaded tandem down a steep ramp about 10 centimetres wide without slipping on the slick metal staircase. There were more close calls than we cared for. We were exhausted by the time we threaded our way through the hectic Seoul rush hour traffic and arrived at our guesthouse. It was 5 PM, and we had been on the go for nearly 48 hours. Time to wash up and do what we really came to Korea to do: eat. *There’s little point trying to mess around with Naver or Kakao Maps outside of Korea, as the server speeds don’t work well across continents. But trust us - once you’re on-site, they’ll do you good.